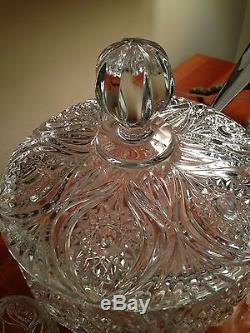 LIDDED PUNCH BOWL W/ 6 CUPS & STERLING SILVER LADLE. 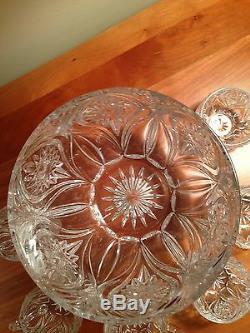 Wow, this is quite an impressive punch bowl set. 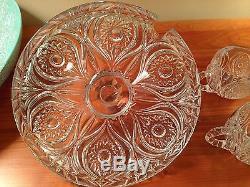 Your table will be so elegant when you serve your guests from this beautiful 24% lead crystal by Nachtmann. This is not a punch bowl you see everywhere. 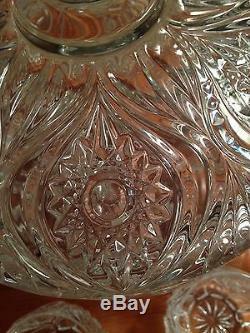 Crystal is in the Florenz pattern. The ladle is sterling silver by International Silver. This set is very heavy, weighing approximately 15 lbs for all pieces. The condition is what I would call PRISTINE. There are absolutely no chips, nicks, flea bites or any other types of issues. I have inspected it many times, running my fingers around every edge, looking for rough spots, and finding none. So many times the cut out for the ladle is damaged due to use, but this one is not. The crystal is very clear. It is clean, not dusty or dirty. Very well cared for, cherished. This is a set to pass down through generations. 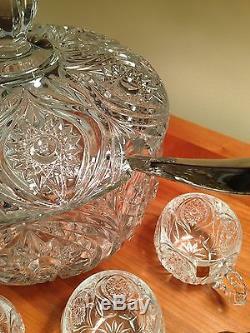 Even if it is never used, it will make a beautiful display or addition to your collection. 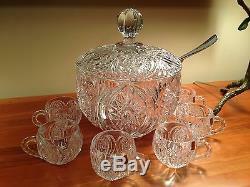 Nachtmann 24% Lidded Punch Bowl Set with 6 cups and silver plate ladle by International Silver. Bowl is approx 6.5 H without lid. Lid has a 3 knob on top. 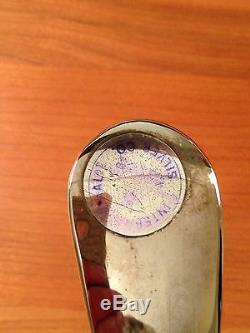 Knob is approx 2 edge to edge. 8 3/4 across top of bowl. 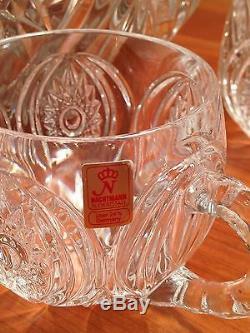 Some cups have labels: "Nachtmann Bleikristall Uber 24% Germany". Cups are approx 3" H 2 3/4" across top Bottom base is approx 1 1/2" Handle is approx 2" from top to bottom and has an opening approx 1 1/4. 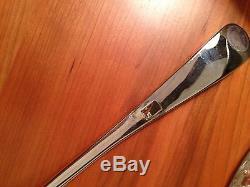 Sterling Silver ladle, marked International Silver. 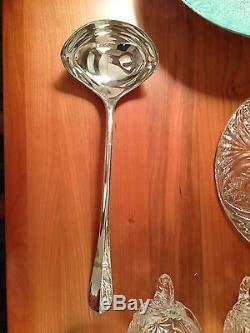 Handle is approx 10 L. The scoop part of the ladle is approx 4 1/4" x 3 1/4". Thank you for shopping with me. Take a peek at my other listings, more added regularly. If there is a problem that I did not mention in the listing, please contact me so that I can try to make things right. I cant help if I dont know about the issue though. I want to provide excellent customer service. If I should overlook something, it is not my intention to mislead you. All of my items come from a nonsmoking home. I recommend my local UPS Store in New Albany, OH. They do a great job. I apologize for any inconvenience. I do my best to accurately describe each item, including details of any issues. I also include photos to help you make an informed decision. Used items are just that-used, not new. I dont list items with major flaws. Even with cleaning and pressing, it is to be expected that pre owned items will not look exactly as they did when brand new, although many do look new. I trust you will feel the same. I take pride in being fair and honest. To take advantage of this discount: BEFORE PAYING, YOU MUST ADD EACH ITEM TO THE SHOPPING CART. AT CHECKOUT, THE DISCOUNT WILL BE CALCULATED AND APPLIED. The item "Nachtmann Bleikristall Florenz Punch Bowl With 6 Cups Ladle PERFECT" is in sale since Friday, April 29, 2016. 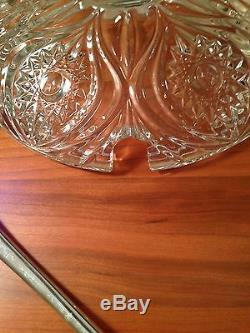 This item is in the category "Pottery & Glass\Glass\Glassware\Cut Glass\Vintage". 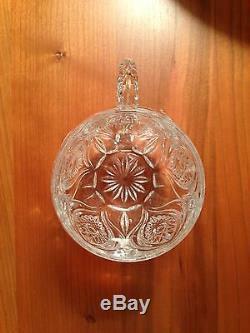 The seller is "finethings4u2" and is located in Westerville, Ohio.